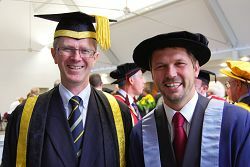 L-R Principal of Harper Adams, Dr David Llewellyn, with Jimmy Doherty who was made a Harper Adams University College Fellow. Five VIPs were honoured for their services to agriculture and given Honorary Degrees and Fellowships as part of the biggest graduation ceremony to date at Harper Adams. More than 600 students were joined by their families, friends and VIP guests at the Shropshire-based campus last week, to celebrate their achievements and collect their graduation certificates. Principal of Harper Adams, Dr David Llewellyn, opened the graduation ceremony which was held in a grand marquee. This year, five VIP guests were the recipients of Honorary Degrees and Fellowships which were presented by various people affiliated with the University College. Farmer and television presenter, Dr Jimmy Doherty of the BBC’s Jimmy’s Farm and Farming Heroes became a Fellow of the University College. He said: “To be here at Harper Adams today is very exciting. Award ceremonies and graduation ceremonies are fantastically exciting. It’s thrilling for me to get an award, but it’s even more thrilling to see all the young people graduating today because it fills you full of excitement and admiration for all their hard work and also it makes you feel a little bit safer in the world. “We’ve got a big job to do. Our population is growing and we have got to feed that growing population on the same amount of land we have today and the people at the forefront of that battle are going to be the farmers. A further Fellowship was awarded to Mr Richard Matson, equestrian expert and entrepreneur, based at Twemlows Stud Farm in North Shropshire. Mr Matson, former Chairman of Governors at Harper Adams, said being given this wonderful recognition was “marvellous”. 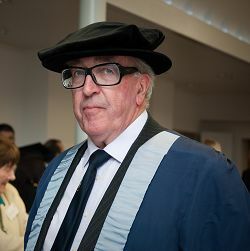 Sir Anthony Bamford DL, after whom the Harper Adams Bamford Library is named, received an Honorary Doctorate of Science. Sir Anthony, Chairman of JCB, was honoured for the outstanding contribution he has made to agricultural engineering, both in the UK and worldwide. 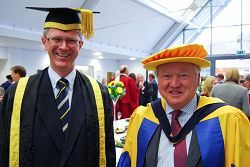 A further Honorary Doctorate of Science recipient was the Agriculture and Horticulture Development Board’s Chief Scientist, Professor Ian Crute CBE, in recognition of his “leading role in crop research and associated disciplines and his role in national agriculture developments”. The final Honorary Doctorate was presented to staunch supporter of the rural economy Baroness Hazel Byford DBE. Baroness Byford was made a peer in the House of Lords in 1996 and has been on the Conservative bench and Shadow Minister for 10 of the last 13 years. She said: “This has been my third time at Harper Adams. It’s a great joy but the changes are remarkable over the years. “What a wonderful University College to be at. The facilities and opportunities are very vast as well as the courses here going from the creation of food to the food products at the end of the day and combined with engineering and the importance at the end of day of the earth’s natural resources. Mr Richard Matson, who was given an Honorary Fellowship. 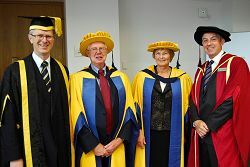 L-R Principal of Harper Adams, Dr David Lewellyn with Professor Ian Crute, an Honorary Doctor of Science, Baroness Hazel Byford, Honorary Doctor and Vice Principal at Harper Adams, Professor Peter Mills. L-R Dr David Llewellyn and Sir Anthony Bamford, an Honorary Doctor of Science at HAUC.